Dan will soon take possession of a 300-acre farm in Kentucky, as one does. It’s a great opportunity, but now he needs a vehicle to manage all that land. He is thinking of spending a modest budget on a “farm truck” that will be exclusively driven on the property. What car should he buy? My wife and I are moving onto a 300-acre farm which has been in the family for over 100 years. The driveway is over half a mile long so there’s plenty of room. We have a 10-year-old F-150, but we’re thinking about getting a true “farm truck.” We had thought about a Gator or similar “all-terrain utility vehicle” type thing... and then my wife asked about some of the small trucks we’d seen when we were traveling in Italy a few years ago. So my mind immediately went to Jalopnik and Kei cars and wondered if there were Kei trucks. Why not find a street legal 25-year-old kei truck/mini truck 4x4 instead of a plasticky gator thing? As for budget, we can spend up to $10,000. Expert 1: Tom McParland - When In Rome…. Look, Dan, I love the idea of living out some JDM fantasy with a cute little Daihatsu whatever poking around the property. Certainly my colleagues are sure to suggest some wonderful and weird cars on that end. But I’m going to level with you, man: What happens when your little JDM runabout needs parts or service? You are on 300 acres and in the middle of nowhere. On a work vehicle ease of repair is key. And what if you need to get to the other side of property right now? Do you want to mosey on over there with 30 horsepower, or have a couple hundred cubic inches of American V8 iron? I’m going to suggest a real truck: something that has some age on it, but that any corner mechanic can fix with parts from a local junkyard. Here is a 1985 Chevy 4x4, that has had some work done. It’s got a Bulldog four-speed. I don’t know what that means, but that sounds awesome. The ride height with the monster truck wheels might be a bit much for dumping things, but I’m sure you will manage. Just open the tailgate and peel out. All those contents will find their place. At less than $4,000, you have plenty of budget left over to get parts. I am with you on the rejections of plasticky 4x4s. 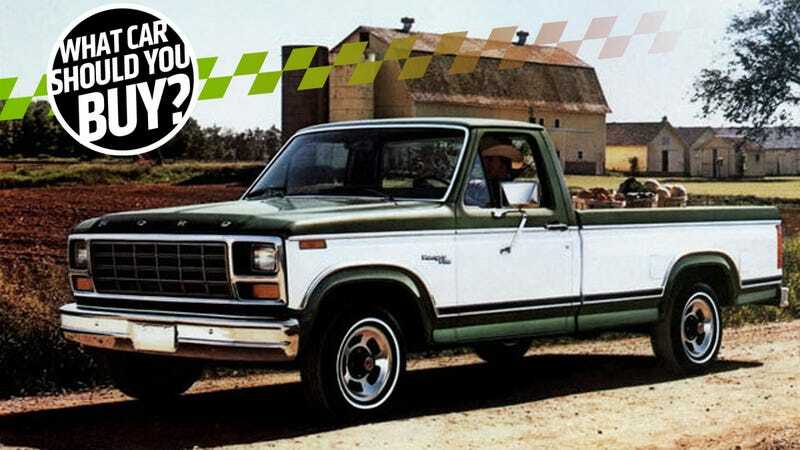 And by the sounds of it, you want something that will be a little different than the old beater F-150s or Tacomas that fill most farm-vehicle niches. While I like old Detroit steel, I loooove old trucks. Their big, doe-eyed headlights, their rounded off cabs, everything looks cartoonishly proportioned. They’re just like me, tough and unbreakable on the inside, absolutely adorable on the outside. Plus, an old, real-deal truck is something you can fix in a field with nothing more than a pretty average toolbox. An old truck is something that has stood the test of time and the elements. As the old adage goes, they just don’t make them like they used to. So let me suggest something that won’t throw codes when it has engine troubles. Something that will blend in with the woods and stand out in a parking lot filled with your fellow rural Kentuckians vehicles: this awfully painted 1964 International Scout. International Harvester started building these beauties in 1960 and stopped in 1980, so goofy retro is the only look these tough little machines come in. It’s definitely in the running as the grandaddy of the SUV, but as a truck it’s more practical for your needs. These things were designed to take on Jeeps in off-road worthiness, so no matter where your farming takes you on your land, your new Scout will be able to handle it. And it’s so cheap, you can use that left over $5,000 to put in a lift kit or repair some of the rust every International Scout comes with. It’s a fun vehicle, tough enough to handle farm life, and cheap enough for you bang around in without stress. I’m going to assume that the small trucks that your wife recalled seeing in Italy include the magical contraption you see above: the Piaggio Ape. These little trucks were never sold in the U.S., but you can just import one, since they’ve been making these things since shortly after World War II. That 25-year import rule shouldn’t be an issue. There are a number of different variants out there, including ones with handlebars or steering wheels, and ones with different engine displacements. There’s a 50cc “Ape 50" for sale on Germany’s Craigslist-equivalent for about $4,000, and there’s a more powerful ~220cc “TM” model for about $3,600. My coworker Jason got to drive that second model, and if you weren’t already convinced that you need to buy one of these incredible little three-wheelers, that video above will definitely push you overboard. “So my mind immediately went to Jalopnik and Kei cars and wondered if there were Kei trucks,” he says. Friend, you have come to the right place. And I won’t let you down. You have impeccable timing, because right now our friends at Japanese Classics in Virginia are selling this 1991 Honda Acty with just 54,000 miles. They only want $5,995 for it, too. What a deal! It’s not clear to me if this particular one is four-wheel drive or not, but if it is, you should go for it. Its tough three-cylinder, 660cc engine will make light farm duty a breeze, and it’s so compact it can be useful in tons of situations. Plus, if you feel like getting fancy, you can bring it to Pebble Beach some year. Ask me how I know this.